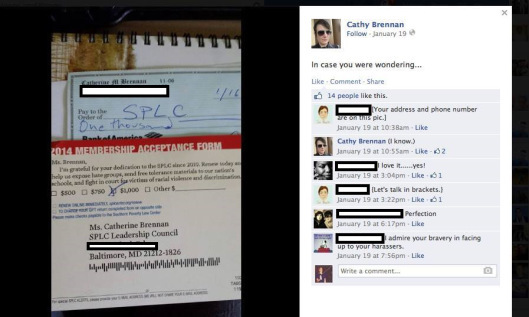 In late November of last year, Secular Woman began a petition asking the Southern Poverty Law Center (SPLC) to list Cathy Brennan’s Gender Identity Watch as a hate group. 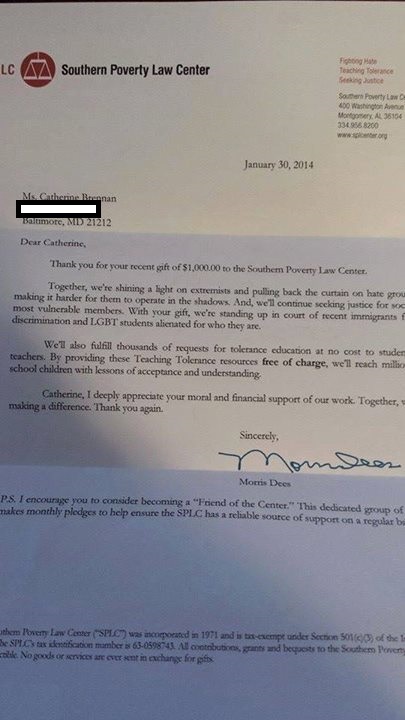 In January, during the SPLC’s internal discussions concerning their yearly hate group list, Cathy Brennan made public her donations to the SPLC on her facebook page. 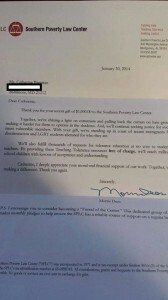 And the SPLC accepted her donation. 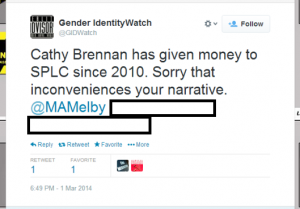 When asked about the donations, the Gender Identity Watch twitter account claimed that Cathy Brennan routinely donated money to the SPLC. 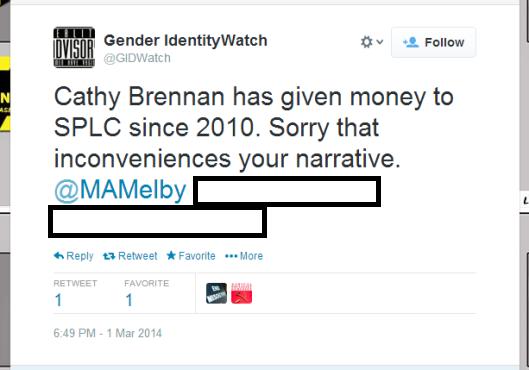 Cathy Brennan has also previously been consulted by the SPLC on issues concerning fringe Men’s Rights Activists. When the SPLC list was later revealed, Gender Identity Watch was not included. The stated reason was that Gender Identity Watch was not a “group” by their definition. However, the SPLC did list a vehemently anti-gay and anti-trans religiously motivated lobbying group, The Pacific Justice Institute (PJI). Although Brennan denies ties to the PJI, interactions between Gender Identity Watch and the PJI have been documented by Transadvocate. 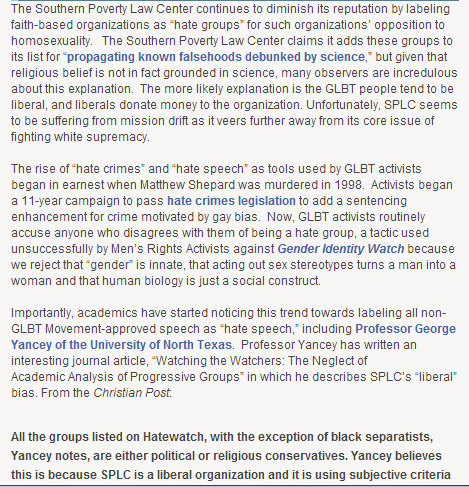 The Southern Poverty Law Center continues to diminish its reputation by labeling faith-based organizations as “hate groups” for such organizations’ opposition to homosexuality. The article later accuses the SPLC of having a liberal bias, and being swayed by donations from the “liberal” LGBT community. The more likely explanation is the GLBT people tend to be liberal, and liberals donate money to the organization. The article also implies that “faith-based” groups should be treated differently due to their ideological stances being based in religion. I really have no idea what you mean when you talk about our “complicity” with Catherine Brennan. And where do you get the idea that we’re receiving donations from her? I don’t think that’s true. We will not be accepting any further donations from Ms. Brennan.